Today Blizzard announced Copa América 2017. 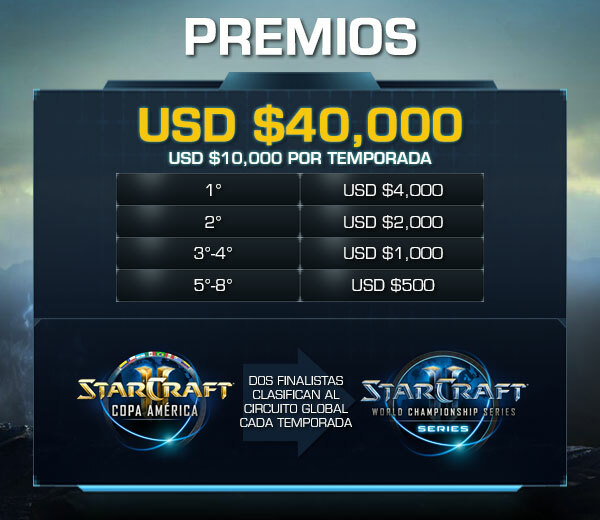 It follows a similar pattern to previous years, gathering the best players from Latin America and giving seeds to the WCS Championships. * 4 Online seasons of 16 players each. * Each season will have 4 qualifiers where 4 players for each one qualify. * Ro16 Group Stage Bo3. * Playoffs single elimination, Bo5 quarterfinals and semifinals. Bo7 Finals. * Top 2 players qualify to their respective season WCS Championship. First season qualifiers begins on the 13th of March. There won't be official streams until the group stage begins, but the qualifiers can be casted by community casters. ...waiting for a new season of proper banners! Talk to me in ~12 days. Anyone knows anything about WCS Challenger? I thought those Challenger events will feed qualified players to WCS Championships AKA DreamHack which is coming up soon. Still no information whatever. I think I misunderstood. Is the prize pool 40k or 10k? It's 10k per season I guess. Probably gonna be 4 seasons before WCS?